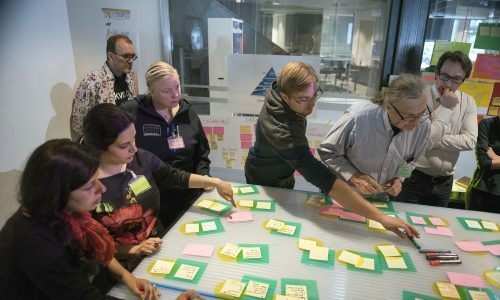 A diverse group of individuals representing public agencies, industry, academia and citizens, came together on 12 May for the first Ground Truth 2.0 co-design workshop in Stockholm, one of the locations of the Swedish Demo Case. The workshop was designed to identify needs in relation to the issue of water quality that impacts on cooperative planning, management of natural resources & environmental stewardship. The session was highly interactive. In a hands on exercise with post-it notes, clustered thematically, the central challenge was identified. Then, in groups, the participants further iterated the challenge with current trends in each domain represented and talked about how to address the challenge. The group discussed which descriptors or indicators are useful to observe the impacts of the challenge on the natural environment, the economy, society and government, as well as individual wellbeing. From there, the group moved to a causal analysis asking why things happen the way they do, identifying patterns in trends and looking for cause‐and‐effect relationships between descriptors. The following stage focused on what can be done and by who. The participants articulated vision & mission statements for their citizen observatory and agreed on a common vision in the end. They then reflected on what concrete objectives emerged from that mission & vision. The workshop was concluded by filling in story cards, helping to generate a narrative for what the citizen observatory could provide and facilitate. The workshop is part of the co-design and co-creation approach of Ground Truth 2.0. This iterative process of the Citizen Observatories (COs) with stakeholders takes into account local governance goals, customs and languages to map user requirements for the technical and functional aspects of the COs. A follow up workshop in Stockholm will be held in June. The Swedish Demo Case is led by Stockholm University.